Great disruptors not only build companies that transform the lives of billions of people, but they also use their fame and money to continue the transformation. Jack Ma was an eighth-grade teacher in China before he founded his company, Alibaba, which quickly became the largest retailer in the world. When the company went public on the New York Stock Exchange on September 19, 2014, it was the biggest IPO ever. Ma has become the face of the Chinese industrial juggernaut— possibly the biggest current disruptive threat to many American businesses in the twenty-first century. Over the past 10 years Ma has dedicated much of his wealth to defending the environment, and recently he has become more vociferous about the need to use great wealth to have a positive impact on the world. Ma likes to make audacious pronouncements in public about transforming the world. Ever the disruptor, he sometimes starts them off quite provocatively. 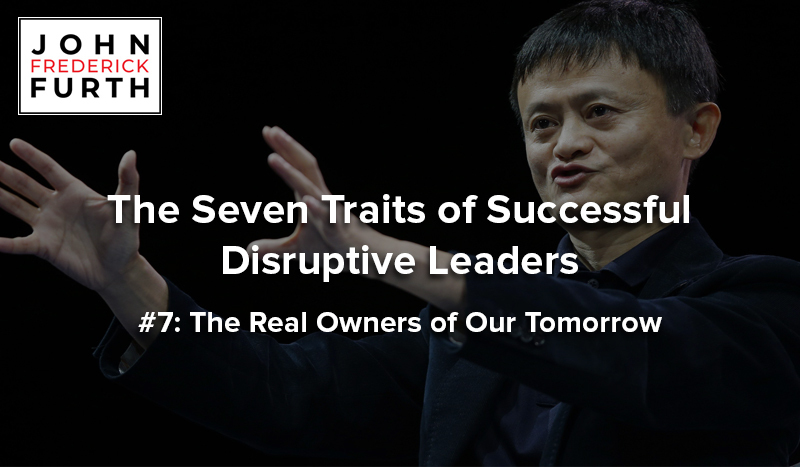 Jack Ma is one of many disruptive leaders who commit their time, intellect and resources to transforming the world beyond building and running disruptive companies. CEOs such as Bill Gates, Jeff Bezos, Michael Dell are giving back by supporting young entrepreneurs, promoting environmentalism and education, and eliminating inequality and unnecessary health risks among the needy. Even Ray Kroc – another influential though not uncontroversial disruptor – and his third wife donated most of their fortune to charitable causes. Early in their journeys, all great business disruptors learned a deep truth: As long as you embrace the unstoppable force of disruption and develop the right skills and mindset you will live a life of abundance, success and happiness, but more importantly, no one will own your tomorrow except you.